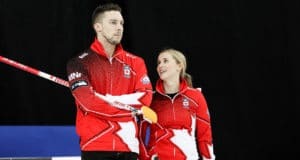 OTTAWA – Kevin Koe’s razor-thin pick of a Brad Gushue counter in the seventh end was the pivotal shot that led to Alberta’s 9-5 win over Newfoundland-Labrador in the championship game of the Tim Hortons Brier Sunday evening. It was a crushing blow for Gushue, who was trying to win his first Brier. “It’s very disappointing, but I think we can take some consolation in the fact they played very well,” said Gushue. “We went for it the first couple of ends, taking our chance and it didn’t happen. Credit has to go to Kevin and his group, they played a phenomenal game. It was just the second time that teams from one curling club captured both Tim Hortons Brier and Scotties Tournament of Hearts titles in the same season. 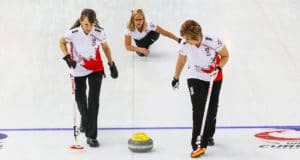 Both Team Koe and Team Chelsea Carey, who won the Scotties two weeks ago in Grande Prairie, Alta., hail from the Glencoe Club in Calgary. In 2004, two teams from the Mayflower Club in Halifax, skipped by Mark Dacey and Colleen Jones, captured the Brier and Scotties titles. Koe’s shot in the seventh not only killed the Newfoundland-Labrador counter and gave Alberta three for a 7-3 lead, it crushed the hope of Gushue finally winning the Tim Hortons Brier in his 13th attempt and silenced the sellout crowd in TD Place. “He’s been throwing the out-turn, the hard one so good. We felt he had a really good chance of making that one,” Alberta third Marc Kennedy said of Koe. “He played amazing. The whole team played great but that happens when you feel confident in the player behind you. I felt the whole week I just had to make it easy on Kevin because he wasn’t going to miss. Playing in front of a decidedly pro-Gushue crowd of 8,419 — it brought the Tim Hortons Brier total to 115,047 — Koe was at his best in winning his third Tim Hortons Brier in five trips to the Canadian men’s championship. He also won in 2010 and 2014. And he had superb support from Kennedy, second Brent Laing, who was credited with shooting 100 per cent in the game, lead Ben Hebert, alternate Scott Pfeifer and coach John Dunn. Koe’s draw weight was perfect from his first rock, leading to stolen points in the first two ends. Gushue got one back in three but when Nichols rubbed on his own guard in four that created the chance for Koe to get two. And they did, for a 4-1 lead. That was a familiar position for Gushue and crew. They trailed Northern Ontario 4-1 after five ends of the Page 1-2 game but rallied to win. They got one in five and a steal in six but ultimately couldn’t match Alberta’s shotmaking. 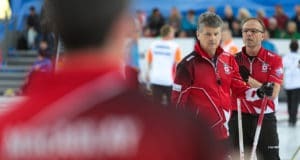 The win was the 27th for Team Alberta, tying it with Manitoba for the most Brier titles, although Team Canada, out of Calgary, won last year, which would give Alberta 28. The win was worth $225,000 (including $144,000 in Sport Canada funding over two years) and 88.678 Canadian Team Ranking System points. Gushue won won $61,000 and 69.676 points. Gushue got to the final by handing Brad Jacobs of Northern Ontario his first loss of the event, 7-6 in the Page 1-2 game on Friday. Koe went the long route, beating Mike McEwen of Manitoba 7-5 in the Page 3-4 game and then Jacobs 6-5 in the semifinal. Jacobs scored one in the 11th end to beat McEwen 7-6 in the bronze-medal game earlier Sunday. That earned the Northern Ontario team $51,000 and 53.840 points for third place. McEwen took home $41,000 and 38.005 points. Koe will now represent Canada at the 2016 World Men’s Championship, April 2-10 in Basel, Switzerland. They also earned berths in the 2016 Home Hardware Canada Cup in Brandon, Man. ; the 2017 World Financial Group Continental Cup, presented by Boyd Gaming, in Las Vegas, and the 2017 Tim Hortons Brier in St. John’s. If they medal at the worlds in Switzerland, they will also qualify for the 2017 Tim Hortons Roar of the Rings in Ottawa — the event that will decide Canada’s four-player teams for the 2018 Winter Olympics in PyeongChang, South Korea. Next year’s Tim Hortons Brier will be played in St. John’s. This story will be posted in French as soon as possible at https://www.curling.ca/2016brier/?lang=fr.